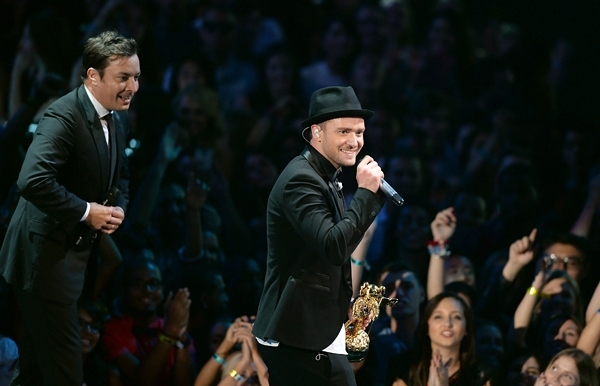 Justin Timberlake and Jimmy Fallon's friendship is growing even closer. After the singer and talk show host dropped the smooth grooving "Evolution of End Zone Dancing" on Late Night With Jimmy Fallon last night – which included gems like "Taking a Selfie," "Worm on a Leash" and an upgraded "Tebowing" – the pals announced on Facebookand Tumblr that Timberlake will appear on Fallon every Tuesday in September for "Timberlake Tuesdays." The timing matches up well, of course: Timberlake is releasing The 20/20 Experience: 2 of 2 on September 30th. Timberlake and Fallon did a similar campaign in March for the first part of The 20/20 Experience, launching a "Justin Timberlake week" on Late Night ahead of the album's release.